Wipe on with a cloth or apply with a foam brush for a hard, durable satin-sheen topcoat. Arm-R-Seal topcoats are made with only the highest-quality urethane resin, making them extremely durable and long lasting. Suggested Surface Prep: Clean, bare wood sanded with 150 or 180 grit paper. 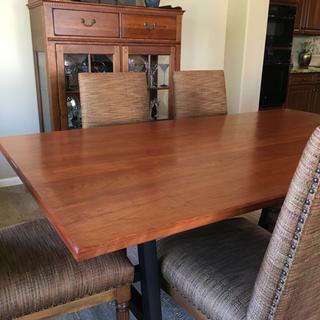 A good friend made a new walnut dining room table for me and left the finishing to me! I took a class at the local Rockler store and decided to use Arm-R-Seal in satin. This finish is the easiest finish to get great results! I have been finishing all types of wood trim and furniture for over 30 years and this is the absolute best finish for furniture. Easy to apply and beautiful results. Durable too! Great product. Goes on smoothly. Easy application for multiple coats. Used on live edge fresh cut slab. Brought out the natural color of the wood beautifully without giving it that 'yellow' tinge I have had with other products. Anxious to try the Gel stain. Rockler the one stop for finishes. I used this product on a table built last year. I found it easy to use and of high quality. 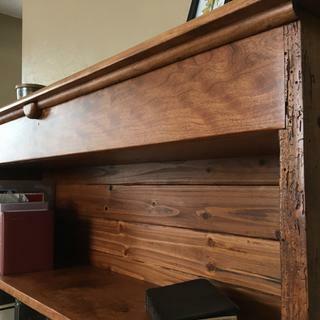 Since my wife wanted it to match the cabinet in the room next to it, General Finishes makes various stains and dyes to accomplish the finishing part of the project. Best product for a great finish. Usually no need for more than three coats, apply with soft cloth. Sand with 220 grit before last quote, steel wool after final coat, buff. Have used this product on multiple different projects. It never fails to produce. Easy to apply, easy to finish. Easy to apply, beautiful finish. Used Arm R Seal for the first time to seal/finish the top of a live edge/slab coffee table I was building. Per the recommendation of the staff at Rockler, I first used Seal A Cell (also by General) as a base layer to bring out the grain of the wood. Followed with 3 coats of Arm R Seal (Satin). Was easy to apply with a foam brush, and produced an outstanding, smooth finish. Per the directions, I stirred the product often to make sure that whatever they add to damp down the sheen in the Satin product stayed in suspension. Way better than the straight Polyurethane finishes I have been using. I will use this product whenever I need a durable finish in the future. This is my favorite go to finish. Wipes on so easy, builds slowly but makes a smooth beautiful finish . I used a folded cloth to apply and it applies smoothly. This product is easy to handle and dries to a hard, smooth finish. It looks rough when it is applied but the irregularities disappear as it dries. Brush cleaning is easy with paint thinner. Be sure to stir very thoroughly. Plan on three coats in most cases, with light sanding between coats. This covered my gel stain and worked as it should. Easy to add apply. Builds quick. Always liked this product. can apply with a rag so makes application quick on complex pieces of furniture. Silky smooth finish - long lasting - used it for years. Would highly recommend this product. As a beginner woodworker, this was very easy to apply. I applied the first two coats with a foam brush, wiping off the excess. Then did two more coats wiping on by hand with a cloth. Sanded with 440 grit sandpaper in between coats, and allowed about 6 hours for dry time between coats. I had excellent results, a smooth finish, with no streaks or blemishes. Thanks Rockler! I am fairly new to Arm-R-Seal. I have used it on a couple cabinet I’ve made and am very pleased with the finish. I purchase it by the gallon now. Best product I have used for a satin finish on a very old antique table, dries fast and smooth. Arm-R-Seal is one of the easiest poly finishes to apply. I use a small rag folded into a 2" applicator pad. You can cut it with some mineral spirits if you are wanting lighter coats but I find the original mix to be just right. I WOULD RECOMMEND IT AND PLAN ON USING IT AGAIN. Good product I'll be using it again! I love the finish this adds to my project. It seems durable and it doesn't look thick or goopy. Goes on smooth with no brush marks. Just make sure you stir it often. I am a fan of the wipe on finishes. This one cures quickly, builds quickly, and leaves a professional spray quality finish. No drips, runs, or errors. Great stuff! This was just what I needed for a farm table. Excellent finish. Easy to use. 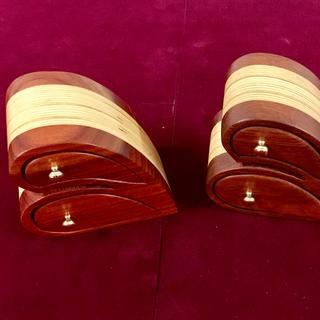 Watch The Wood Whisperer video “A Simple Varnish Finish” for instructions on how to get a beautiful finish on your project. Very easy to use and you get good finishes consistently. Used this product for about 20 yrs. and will continue to use it. 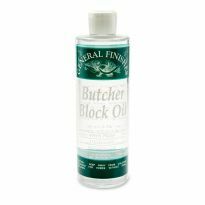 I have used this on numerous projects with great results. Building kitchen cabinets. This is a great finish. easy to apply, no brush marks. This the best product to use on your projects. Don’t buy larger to save money. Product turns to goo if it sits more than six months. I have typically used Sam Maloof's Poly/Oil. I appreciate the faster drying time with the General, particularly on larger projects. I feel like the finish I get with General is very close to that with Maloof's, but will still use Maloof's on smaller projects. The cost differential also favors the General over Sam. Beautiful finish when mixed with Tung Oil and Mineral Spirits. Looks awesome on my rifle stocks. I am going to continue buying this! Great product, dries fast and never streaks. This is a great top coat and is very forgiving. As long as you don't go light on the application it will smooth out nearly all bubbles, which is great for those just getting started. Rough end remnant of a piece of red wood slab. Great product, easy to work with. Just need to know, it hardens with oxygen mixed in. I would like to buy smaller canister to minimize the waist. Two projects completed using this product. Excellent results. Ordered this based on the excellent on-line reviews of it! great on this product and im looking for a harder finish but without a high gloss. your product delivers that and based on photos I saw on your page using this project that's the look I desire to achieve. A re-order. Used previously, with great results! One of your guys recommended it to me on the phone. I am happy with it. It's my go-to oil based finish. I'm restoring a vintage walnut chair and this won't have the plasticky look of some of the water-borne finishes that weren't around in that era. I saw a post on Pinterest. Recommended by your website so decided to try it. it works if it works DONT FIX IT !!!!! Good review by Youtube show "the Wood Whisperer"
I am anxious to try this product...it sounds like it will be easy to apply and i love to put a durable finish on my refinished items!! This is the second step in refinishing a dresser. 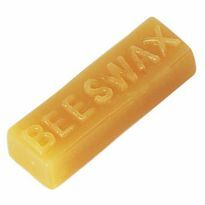 I am using this to add durability to the finish and seal it for use in my home. My brother uses this and said it was a wonderful product. This is my first time trying this. Started using it a few years ago and won't use anything else. Easy to apply with no brush marks. Sand between coats and you can build up a great finish with real depth. Have used this finish exclusively for many years and find it to be the best all around finish on the market. Tried and true. My favorite finish for projects when I don't want to spray. Recommendations made on online forums. A proven winner. I have had great success with this product when just wiping it on with a rag made of T-shirt material. Three to four thin coats each sanded at 400 between coats. Works great for someone without a spray booth set up but who still cares about trying to get a high quality finish. Seams that most of the "Experts" like this product, so who am I to argue with that? I like the richness of oil base and this is the General Finish oil topcoat recommended for kitchens in the videos. We have used it and love it. I have used it before and love how you can apply thick coats and it self levels. Three coats over stain is all you need. Watching WoodWorks with David Marks. Been using general finish products for several years now and love the results. Best finish that I have used so far. Have been using this same product for many years, easy to apply, easy cleanup, satin finish looks terrific, brings out beautiful woodgrain and lasts and looks great for many years. 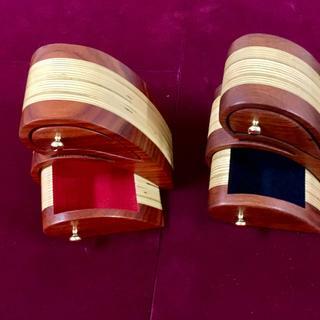 Used on different exotic hardwoods, (favorite is Canary wood), for long lasting protection. I need this for my cabinets. It has very good reviews. Excellent finish, repeat user. This top coat is extremely easy to apply with a cotton cloth. By far the best sealer I have ever used. The product is self-leveling with no drag marks from applying to the project. 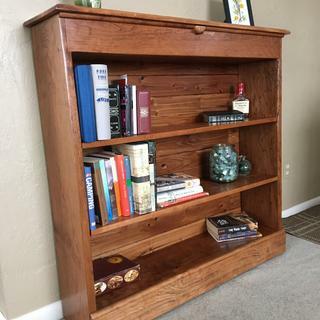 Projects made from 2-3 years ago to date show no yellowing or cracking of finish. have not used before-have been using varathane 3x and am not happy with it--wanted to try something better.have used other GeneralFinishes products in the past and liked. I'm going to fill a void (up to 3" wide and 3 feet long) with rocks/epoxy. 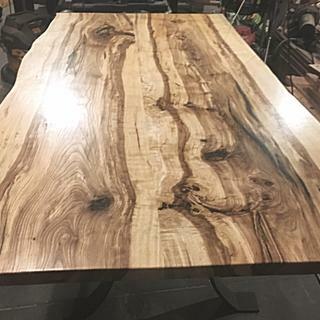 The green ash live edge dining table currently has an Arm-R-Seal satin top coat over Seal-A Cell clear. 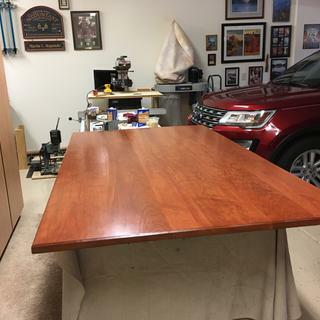 How should I prep the epoxy when I am ready to refinish the entire table top? Either works great. I am using the gel topcoat on the fronts of some cabinet doors and frames, because they are either vertical or have detail work or both. By using the Gel topcoat and wiping it off, I don't get runs. It does require more coats but it's a beautiful furniture like finish. Satin is it for Gel topcoat, no semi-gloss. On the other hand I use the Arm-R-Seal semi gloss on the door backs because it's fast and durable. The door are laying flat, so few runs and I really don't care so much about a furniture finish on the backs. Used Min-wax for years but GF polys give a much better finish. Will arm r seal yellow over a light colored paint ? BEST ANSWER: It will give an amber cast to light wood such as maple. I don't think it's appropriate over pigmented finish. It is meant to penetrate on the first coat the build lightly. I have never used this topcoat over paint, but it does add an amber hue to blond wood, so I would expect it to add the same color over paint. Very happy with the finished results when I have used it. I sure do not know. I have never used this product as a clear coat on a pigmented finish. 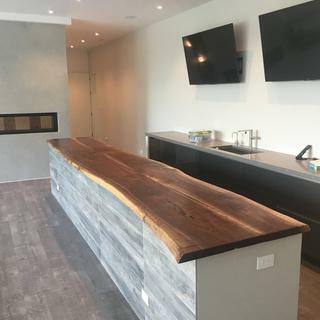 We are staining a fireplace mantel and wanted to know what is the best sealant to use since it will be exposed to varies levels of heat? Thanks! 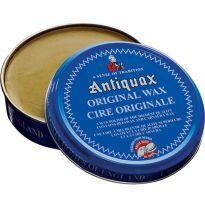 Can I apply this over Waterlox Original as a top coat? Why do I have white places on my finish? I fought a similar issue, smoky white "tiger stripes" in the finish. The only solution was to sand all of the stain off and use General Finish stain. This has happened to me when the humidity is very high. Enter an answer to this question. I need to finish a unfinished dining table made of rustic, reclaimed, whitewashed oak beams. Is this + seal-a-cell a suitable combination? 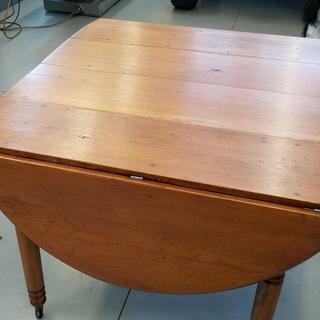 Would like to avoid any shininess and preserve the original color of the wood (slightly faded white). BEST ANSWER: Normally a table would want good moisture resistance and the combination of sealer and topcoat would work fairly well. A spar varnish is best. Oil based Polyurethanes have a golden color that might not want. A water based poly is more clear. Might want to steel wool between coats to get a smoother finish. I have used the sealer without topcoat to get a flat finish but it's not a great moisture barrier alone. Steel wool (#0000) will even it out because the sealer has some poly in it (where tung oil does not). BEST ANSWER: Definitely use an an epoxy. If you apply this finish over the epoxy it creates a great clear area in the slab. It looks awesome in knots in rustic furniture. I would use a 2 part epoxy and then use their Arm R Seal as directed. I have done this in the past with great results. 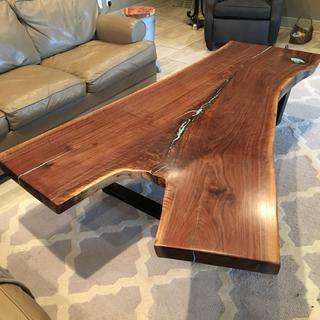 I'm finishing a redwood slab dining table (indoor use) and want to end up with a satin finish but I've read that it's best to get the gloss finish and then buff out the top coat with 0000 steel wool? BEST ANSWER: I just made a cherry and walnut computer desk and used this finish generals satin, and I used the 0000 after very lightly sanding wth a 320 grit paper I didnt sand until the 2nd coat was dry then appkied 3rd coat and it turnd out great the colors are vibrant and the grains looks awsome and the smell went away after 8hrs it smells great after 24hrs.i used a foam brush too. After trying a shirt and reg brush the foam applied it the best. You're on the right track! I use armrseal quite a lot (yesterday in fact!) and I follow a different process I learned years ago. Put on two or three costs of armrseal gloss and then do one coat of armrseal satin. The sheen that shows is the last one applied. The theory is that you should end up with more of a crystal clear finish than if you had used. 3-4 coats of satin only. Hope this helps! Good luck! I used the satin on my kitchen cabinets and have done no buffing...the final finish is beautiful! Did three coats with at least twenty four hrs. dry time inbetween each coat! Hope this helps...good luck! I've read the same thing. However, I've used satin with 4-5 costs and it tuned out fine, Why rubout with wool when you can get it with the product selection? How long should armour seal dry between coats? BEST ANSWER: I generally recoat the next day. Sometimes if humidity and temperature are just right it will dry a lot quicker than that. after dry I wipe down with a scotchbrite type of pad (you can get them at paint stores) before recoating. 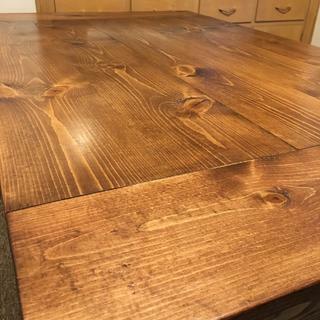 I've had a kitchen table with this on it for 5 years and it stilllooks great (3 coats). I've used this product a lot and I like it very much. I found it best to allow each coat to dry overnight and sometimes even up to 24 hours before sanding between coats. You want it to be completely hard and dry before sanding so it also depends on how heavy you are laying it on. Does the Arm R Seal satin finish need to be lightly sanded between coats? Applying over GF Java stain. BEST ANSWER: Yes, it is best to lightly sand between coats. I finished a solid oak table top and applied the Arm R Seal with a clean cotton rag (I cut up old t-shirts). It applied very well, but by sanding between coats you can achieve a glass like top that is extremely smooth. Between the last couple of coats I used 0000 steel wool (ultra fine) between coats. That worked great. Also, be sure to vacuum and tack cloth after sanding each time. Yes, it needs to be "sanded". My experience is that using a 300 grit paper/pad may locally bite totally through the Arm R Seal and damage then stain. I find it's better to use a #0000 steel wool. Don't be stingy - use a new face or a new pad every 2 - 3 sq.ft. Just completed a 7 drawer chest with lots of curved surfaces - it came out great using the steel wool. Hi Brenda. 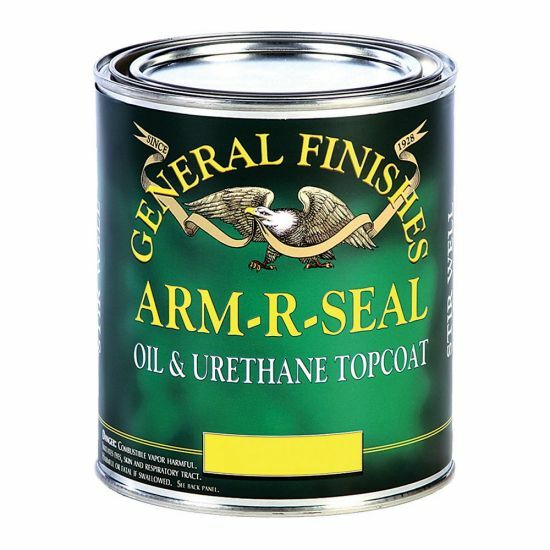 The General Finishes ArmRSeal is a polyurethane product and does require a light sanding between coats. I generally start with the highest grit that I've used in preparing the piece for sanding, and tend to up the grit of the sandpaper between coats. Can I spray this product? BEST ANSWER: Yes, it sprays very well. I use a HVLP sprayer with no thinning required. Sorry, I don't know the answer to that. I have always applied with a spong brush. Can I use Arm-R-Seal as a top coat for a hardwood floor stained with general finishes gel stain? What is the difference between the General Finishes Arm-R-Seal Urethane Topcoat and the General Finishes Gel Topcoat? I have used the Rockler Polyurethane Gel Wipe-on Satin Clear Coat in the past but it seems the product has changed in the last 15 years. Thanks. Can I use this on aN ITEM THAT HAS HOT PANS ON THEM? BEST ANSWER: In my experience hot pans will leave a mark on this finish. I don't know of any finish that wouldn't be affected by hot pans. Use a trivet. That said, it is fairly easy to repair damaged finish by sanding it out and re-applying new coats of finish. There will be some color difference in the sanded out spot because of the UV darkening of all wood. Absolutely not. There isn’t any wood with any finish that could survive a hot pan. Use a trivet or similar. I do not believe that this is a heat resistance product. Do not know, but I would check with the mfg. Is it safe to use ARM R SEAL on cutting boards? BEST ANSWER: No. The application instructions specifically prohibit using this on any food surfaces. Safe? Probably, but why would you want to? You'd be better off using an oil made for that purpose. Unless this "cutting board" is to be for display only I wouldn't use the Arm-R-Seal. I would not use an oil based product on a cutting board. Rocker has a finish for just that purpose. And there's always mineral oil. I can't imagine how it would be. Can I use Arm-R-Seal as a finish coat over GF Gel Topcoat? BEST ANSWER: Yes I used Arm-R-Seal as a finish coat over GF Gel Topcoat on a very old pie safe and it turned out great. Scott, with my application of gel topcoat it didn't work the way it was intended. I was going for as black as night and even after hours of letting it set, and mixing it with trans-tint dye, it still wiped off and exposed too much natural color. I glommed on the gel-goat, let it set for 48 hours and then used spray lacquer. Sorry I'm not helpful but maybe someone has a better answer. Thanks. While I hAve not covered GF Gel topcoat with Arm-R -Seal, I have covered other stains with Arm-R-Seal without issue. BEST ANSWER: It is my experience to follow the directions on the can. These guys know the product and when used as directed it performs great. Word to the wise NEVER take short cuts on finishing from prep to applying the finish to rubbing it out. Yes, sanding between coats removes any raised grain and dust particles. If the look you are trying to achieve comes with one coat stop there. Thanks! Guess I will try to do one good good and see how it looks. My issue is that I'm worried about running out of time before Christmas (I have 6 chairs to finish sanding and staining, and very limited free time) when guests come. I did only because I wanted distress look but one coat was fine and full coverage. I did 2 and sanded between for distress. Should this product be used for a covered front porch door? Rain is not a problem but we do have fog in the winter. I use this all the time on indoor projects, but have never used it outside. General does have products for outdoor use. I suspect they will have the same high quality as Arm-R-Seal. Thank you all for your answers. Neal is there a specific product that you can recommend?The wooden front door is a bit weather worn. I read about the General products and liked them. But I am concerned about the moisture. Check Exterior Finishes on the General Finishes website. Can I use the arm r seal on a kitchen table? 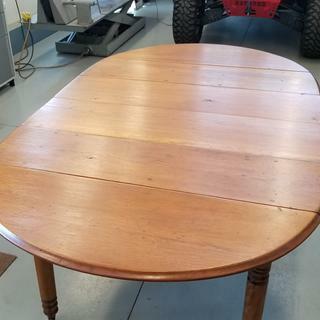 Uses gf brown mahogany gel stain and want to seal it. I want to able to wipe off table after meals. Please advise. BEST ANSWER: Yes. 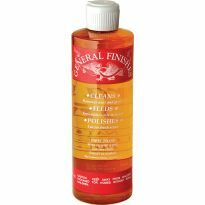 In fact, on the General Finishes website, this is one of the recommended top coats for their gel stains. Both the gel stain and this urethane are oil-based, so there aren't compatibility issues. Yes you can use Arm R Seal for a kitchen table. I would recommend a minimum of three coats. I have found Arm R Seal to be an easy to use product that is very durable. 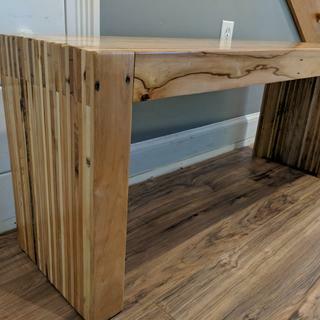 I used the product on a table I made for my son and his family. So far it's holding up just fine and it's been well over a year so far. Thank you can this be used over gf gel top coat satin? I have this product too! 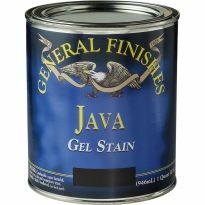 I have a friend who wants to use General finishers gel stain. The area I live in does not allow oil urethanes. What are his options as a top coat? BEST ANSWER: I talked with general finishes about this and they said you can use their waterborne High Performance Topcoat finish over it. Making sure it's dry first is important, 48-72 hours dry time. I haven't put the topcoat on yet since I'm waiting for it to dry right now, though I've used it over wood dye and it goes on really well and dries quickly. the gel stain, but I have used to oil & urethane topcoat, both satin and semi-gloss with good success. can be applied with brush or rag, and after using 0000 steel wool between coats have been very happy with the results. It appears to be a very durable finish. Can I use this over top of chalk paint? BEST ANSWER: I really don't know for sure. I believe it is for use over natural or stained wood, which is the way I use it. Your best bet would be to go to the manufacturers website and ask them. I'm sorry, but I don't know. You would probably do best to contact the manufacturer's technical support line. It would also help if you know any specifics about the chalk paint. Has anyone had experience using this on brick pavers? BEST ANSWER: No. I have only used it on wood as a top coat. Worked OK. For wood, I did find a better product. I've never tried it but I doubt that it would work well. This product is not an exterior finish. I have a large slice of a tree stump that I purchased to use as a table top. My father in law, who is an accomplished woodworker, applied a two coats of the arm r seal oil and urethane topcoat and it looks cloudy and streaked. I'm not sure what caused it. What would be the best way to fix it? Sanding back with 400 grit and recoating? Would steel wool be better or using laquer thinner to strip it off? I answered earlier. Possibly too wet of food? What is the appropriate recoat time for the subsequent coats? All I see is that it dries in 12-24 hours. Thanks! BEST ANSWER: I will normally try to time my finish coats for the end of the day and wait overnight to recoat. Part of my reasoning is that, in my small shop, dust can be a real problem and I try to avoid any operation that is going to throw up dust while my finish is drying. That being said, depending on temperature and humidity I've recoated after about 6 hours before, but that is a really tough call. Between coats I use a really find wet-dry paper (I like 600 grit best) and do a really light sanding. The key to me has always been that if my sanding is anything other than totally clean and not gummed up, I'm ok to go on the second coat. I do really prefer overnight, but we can't always have the amount of time that we like. After it dries, sand with a finer grit, then reapply. I have a dining room table that has had two coats of Liberon FInishing Oil applied to the surface. I want to go over that with a more protective top-coat. Can Arm R Seal be applied over a well-cured oil finish? BEST ANSWER: I have not applied Arm R Seal over a previously existing finish. 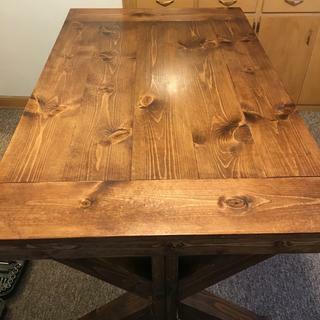 I built a new Kitchen table and applied oil based stain to the top and then applied many coats of Arm R Seal and it turned out beautiful. 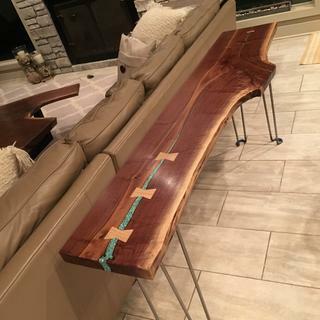 I would think if you sanded your existing finish first with 320 grit sandpaper (by hand and with the grain) that you could apply the Arm R Seal wipe-on finish then. This product is an oil based product so it should work. I used old cotton tshirt pieces to wipe this product on and it turned out well. You will want to lightly sand with 320 grit paper between coats and as you approach the final coat, I was sanding with 0000 steel wool to get an ultra smooth finish. Good luck on your project! You might want to start with coat of clear shellac first to seal it, & then try the cam arm r ! I would try it on a scrap piece first before you commit to the table, good luck! 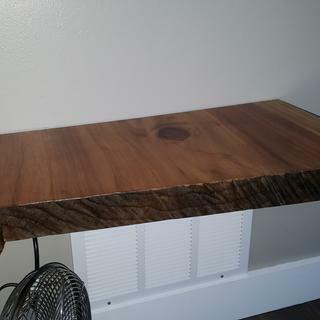 I have 2 in thick walnut table top just completed for mg dinning room table. I'd like to NOT apply a stain to the beautiful wood, but want to protect it and brighten if without a high gloss shellac look. What is the best product or combination of products to use? BEST ANSWER: My personal preference is to use General Finishes Satin urethane. I finished my dining room table with it by thinning with 15% mineral spirits, then applying as a wipe on finish. It took about 7 coats to achieve the look that I wanted, but the results were worth the effort. It has stood up well for 10 years of daily use with no problems. Good Luck with your project. You can use General Finishes Satin Urethane or any other satin clear coat. If you use Lacquer or Shellac you will need to wet sand or use steel wool / wax to reduce the gloss to a satin or matte finish. Is spraying it on a option? Bought the Earlex sprayer from Rockler and want to try it out. BEST ANSWER: Hello Randy, i have used my HVLP sprayer successfully multiple times with this product. You just have to find the happy medium of not too heavy of a coat and not to light of a coat. The claen up to me was the biggest issue for me. i hope this helps! I refinished my bathroom with gel stain, is it recommended to use Arm-R-Seal as a topcoat? Yes, you absolutely want to use the Arm-R-Seal as a topcoat. You'll want to choose the sheen (satin, semi-gloss, gloss, etc.) to determine how "shiny" you want the finish. I put 3 coats normally and it's very protective; it also really brings out the grain in the wood. what do you use to thin this ?? 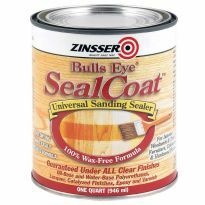 And is their product ' seal-a-cell' which many use prior to this product similar or the same thing as de waxed shellac (zinsser brand)? ?